Microsoft co-founder Paul Allen, a renowned technologist, philanthropist, conservationist and musician has died aged 65. Allen's private company Vulcan Inc confirmed in a statement on Monday evening that its founder had died that afternoon from complications of non-Hodgkin's lymphoma. The 65-year-old had previously battled and defeated the same disease in 2009, but discovered it had returned earlier this month. His final post to social media on October 1 detailed his new battle with cancer, saying doctors were "optimistic that I will see a good result." Vulcan Inc also released a statement from Allen's family, crediting him as a "remarkable individual on every level." 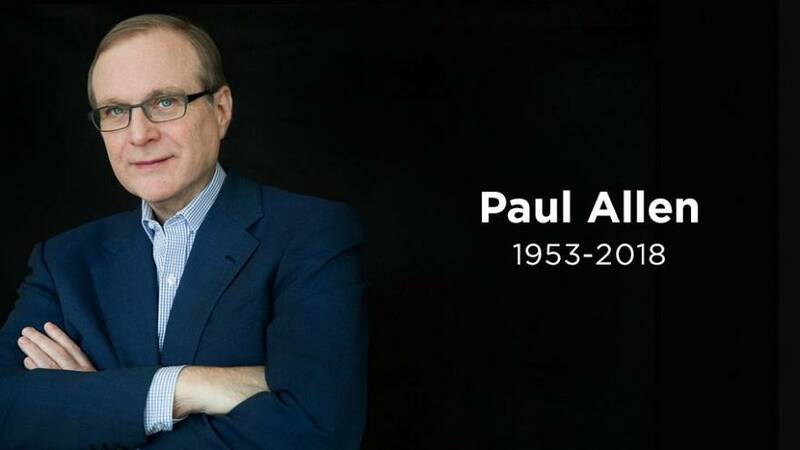 "While most knew Paul Allen as a technologist and philanthropist, for us he was a much loved brother and uncle, and an exceptional friend." "Paul's family and friends were blessed to experience his wit, warmth and generosity and deep concern. For all the demands on his schedule, there was always time for family and friends. At this time of loss and grief for us - and so many others - we are profoundly grateful for the care and concern he demonstrated every day." Vulcan Inc CEO Bill Hilf said, "today we mourn the boss, mentor and friend whose 65 years were too short - and acknowledge the honor it has been to work alongside someone whose life transformed the world." Allen's legacy left behind has been felt across a number of industries, including tech, music, sport and charitable organisations due to his huge expanse of projects. Just some of his achievements include the co-founding of Microsoft with his longtime friend Bill Gates, and directing a research team to discover the wreckage of Musashi, a Japanese ship that was one of the biggest ships used in the Second World War, which was sank in 1944. A Seattle native, Allen was also a sports fan - he owned the NFL's Seattle Seahawks and the NBA's Portland Trail Blazers. On his musical side, he played electric guitar and funded the Experience Music Project, which was dedicated to his hero Jimi Hendrix. According to Forbes, Allen had a net worth of $20 billion, making him one of the richest people in the world. He is estimated to have donated more than $2 billion of his wealth to philanthropic causes during his lifetime. Tributes from high profile figures flooded social media on Monday evening, shortly after the announcement of Allen's death. Leading the tributes was Bill Gates, who spoke about co-founding Microsoft and the philanthropic projects of his childhood friend: "From our early days together at Lakeside School, through our partnership in the creation of Microsoft, to some of our joint philanthropic project over the years, Paul was a true partner and dear friend. 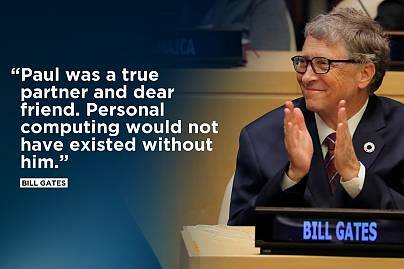 Personal computing would not have existed without him." "But Paul wasn't content with starting one company. He channelled his intellect and compassion into a second act focused on improving people's lives and strengthening communities in Seattle and around the world. He was fond of saying, "If it has the potential to do good, then we should do it." That's the kind of person he was...I will miss him tremendously." Other figureheads in the tech industry also posted to social media, paying their respects to Allen. Apple CEO Tim Cook said the tech "industry has lost a pioneer and our world has lost a force for good," in a post to Twitter. Current Microsoft CEO Satya Nadella spoke of Allen's legacy at Microsoft: "he created magical products, experiences and institutions, and in doing so, he changed the world." Amazon CEO Jeff Bezos said he was "very sad" to hear of Allen's death. "His passion for invention and pushing forward inspired so many," he wrote on Twitter. Other high profile figures also tweeted their condolences. Seattle Seahawks coach Pete Carroll said Allen's "gracious leadership and tremendous inspiration will never be forgotten. The world is a better place because of Paul's passion, commitment, and selflessness. His legacy will live on forever." Hollywood actor Leonardo DiCaprio paid tribute to a "strong advocate for environmental protection." "His legacy lives on via his incredible work as a philanthropist and investor." The official Jimi Hendrix Twitter account, which is controlled by the Hendrix family, simply tweeted a picture of Hendrix' longtime fan, jamming on guitar.